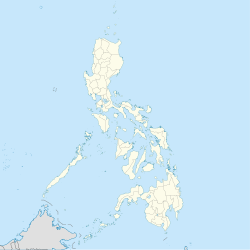 Paglat, officially the Municipality of Paglat, is a — municipality in the province of Maguindanao, Philippines. According to the 2015 census, it has a population of 15,920 people. It was created under Muslim Mindanao Autonomy Act No. 112 on July 19, 2001, carved out of the municipality of General S.K. Pendatun. The first appointed mayor was Bai Zulaika Pendatun-Langkuno, however, her appointment was recalled by then ARMM Governor Nur Misuari to give way for her cousin Datu Conte Mangelen, son of the then Congressman Datu Luminog Mangelen of Cotabato Province. Paglat is politically subdivided into 8 barangays. ^ "Muslim Mindanao Autonomy Act No. 112; An Act Creating Municipality of Paglas in the Province of Maguindanao, Authorizing the Municipality of Gen. S. K. Pendatun and Province of Maguindanao to Appropriate Funds Therefor" (PDF). Regional Legislative Assembly, Autonomous Region in Muslim Mindanao. Retrieved 27 January 2016. ^ "Paglat, Maguindanao : Average Temperatures and Rainfall". Meteoblue. Retrieved 19 January 2019. This article about a location in the Autonomous Region in Muslim Mindanao is a stub. You can help Wikipedia by expanding it. This page was last edited on 24 February 2019, at 10:03 (UTC).